If you are an avid reader, I bet there are a handful of books on your shelf that are special to you. You may have read them when you were young, come across them at a certain time in your life, or had them recommended by a person who is important to you. These special books are more ragged than your others, should probably be replaced by newer versions, but mean something more than you can put into words. You could pick these books up at any time, read them every year, find something different & wonderful about them every time you enter their world. The Hobbit is the first book that fits this category for me, a novel I have read a dozen time and will read a dozen more in the coming years. 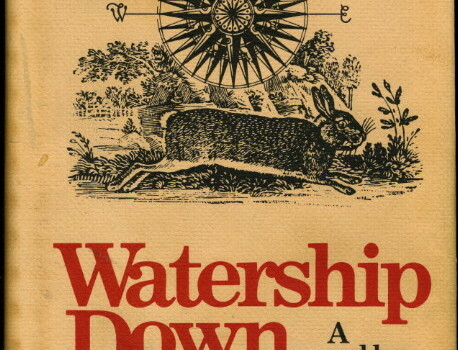 Watership Down is another, a perfect story that transcends words and has become a part of my life. It’s a classic tale of a journey, an odyssey to find a better life. But the twist is that this is also a tale of rabbits, of animals overcoming all odds & enemies to survive where others would have laid down to die. Fiver is a prophetic rabbit, a small & intelligent outskirter who often knows what will happen before it does. He warns his brother Hazel, a smart & steady youngster, that death is coming to the warren. And so Hazel, who has learned to believe Fiver, gathers as many bucks as he can, setting off for who-knows-where with no dream other than to escape. Challenges arise, obstacles must be overcome, and the whole world seems to be set against rabbit-kind. But this small group will prevail using there wit and natural skill, heading toward a distant hill that might just be paradise. For one, this is one of the best stories ever written. It has everything you could possibly want; daring, sacrifice, danger, fraternity, survival, and an overwhelming sense of character. You scoff, but these rabbits are crafted more deeply than most human characters are, with a sense of group that has always impressed me as both enviable and unreachable. I have a dream that someday I’ll write this book into a live-action screenplay, using people instead of rabbits, and winning an Academy Award. But the rabbit element shouldn’t be dismissed, it allows for so much that would be missing from the novel without them. Adams creates a new language, a unique mythology, a god and a Jesus-figure that these characters view as part of their very culture. What Tolkien did with Middle Earth Adams does with Watership, immersing readers in a world that could be right outside our door but is also fantasy at its finest. Don’t dismiss this story; it’s one of the best you’ll ever read.